We are happy to announce our publication on generation of a 3D Alzheimer’s disease model in the lab environment and identification of a protein that rescues the disease pathology. Our results is published in July 2 issue of the journal Developmental Cell. Alzheimer’s disease is incurable and efforts for drug development generally fail. There are only a few drugs available to use for Alzheimer’s patients, yet they are not effective enough. Many factors are known to contribute to the development of Alzheimer’s disease; however, the exact cause is not clear. By definition, Alzheimer’s has long been considered as a neuronal disease as our neurons degenerate and die. However, profound changes in the brain occur before the neurons start dying. For instance, the immune system is sensitized and immune cells become activated, neural stem cells reduce their proliferation ability and cannot produce neurons as they normally do, even if the neurons are not dying yet, they start losing their connections to other neurons. All of these changes happen way before we diagnose a patient with Alzheimer’s. Therefore, there is a clear need to investigate other cell types. In our present study, we investigate the neural stem cells. Alzheimer’s disease has been investigated in animal models, especially in mouse. However, there is significant differences between mouse and human cells, and therefore we aimed at generating a “humanized model” to better represent the actual disease happening in our brains. By using an innovative biomaterial polymer matrix called starPEG-Heparin, we managed to grow human neural stem cells in a 3D environment. These cells behaved as they would in our brains, namely, they divided and formed neurons that later generated a connected neuronal network highly similar to our brains. These neurons were also conducting electricity and responding to external stimuli, two features of our mature neurons in the brain. We later induced Alzheimer’s disease in our 3D environment by using a small protein called Amyloid-beta42, which generates the notorious “plaques” in Alzheimer’s patients. We have observed many features of Alzheimer’s brains, such as lower neural stem cell proliferation, impaired generation of neurons, reduction in neuronal connections, hyperphosphorylation of TAU protein (another hallmark of Alzheimer’s disease brain), and in the end the death of neurons. Our results were highly reminiscent of human brains with Alzheimer’s. Our experimental system is therefore the first human neural stem cell-based 3D Alzheimer’s disease model generated by using Amyloid proteins. We later asked whether we can prevent the toxicity generated by the Amyloid protein in our system. We used a protein that we previously identified in zebrafish (Bhattarai et al., 2016, Cell Reports): Interleukin-4 (IL4). This is a molecule secreted by immune cells and in zebrafish, IL4 alerts the neural stem cells that there is “danger”. Without IL4, zebrafish brain cannot cope with Alzheimer’s and cannot produce new neurons in response to the disease. We found that in humans, IL4 acts very similarly. In our 3D system, treatment with Interleukin-4 rescued the pathological outcomes of the Amyloid and helped neural stem cells to produce more neurons. 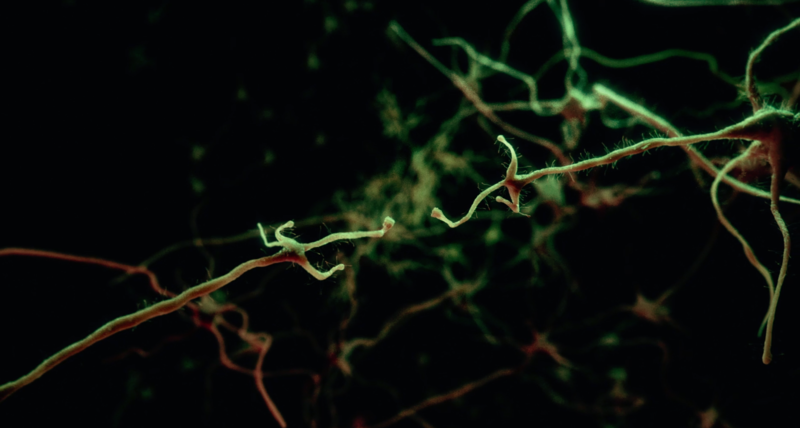 We could regenerate all neuronal networks again despite the presence of Amyloid plaques. This is an exciting finding because it allowed us to identify a very important but highly overlooked cell type for Alzheimer’s disease: neural stem cells. Our results suggest that when we can activate neural stem cells to produce more neurons in disease conditions, we may even cure Alzheimer’s! We also identified how IL4 acts on neural stem cells. We found that IL4 modulates the metabolism of an amino acid called Tryptophan that is essential to production of proteins in every cell. Tryptophan is converted normally into a metabolite called Kyurenic acid. We found that in Alzheimer’s disease, this conversion is sped up and there is abundant Kynurenic acid, which becomes toxic to the cells. In high doses of Kynurenic acid, neural stem cells cannot produce neurons. But IL4 nicely blocks this production and brings the Kynurenic acid levels back to normal levels, therefore, neural stem cells can form more neurons and rescue the Alzheimer’s pathology. When we investigated whether Kynurenic acid production is elevated in Alzheimer’s disease mouse models and human brains, the results were supporting our findings: in human brains with Alzheimer’s disease, Kynurenic acid producing enzyme KAT2 is highly elevated. This means that our system is a realistic and stringent surrogate to analyze the human brain during disease conditions in the lab. Because of all those these properties, our model could be of use not only to study disease processes. We also see important uses in the pharmaceutical industry. Our system could be applied in the early phase of drug development for the testing of chemical compounds. We believe that such a realistic Alzheimer’s model would increase the likelihood of finding more effective drugs for treating Alzheimer’s disease. Whether our results will translate into clinical studies, we cannot say at this stage. At present, this is still fundamental research. A very exciting one! We are grateful to our collaborators Prof. Carsten Werner (Leibniz Institute of Polymer Research, Dresden) and Prof. Yixin Zhang (B-CUBE, TU Dresden) for their valuable contribution and support. 3D Culture Method for Alzheimer’s Disease Modeling Reveals Interleukin-4 Rescues Ab42-Induced Loss of Human Neural Stem Cell Plasticity” Papadimitriou et al., Developmental Cell (2018). Press release from DZNE, CRTD and IPF.